modern rustic. clean white finishes. reclaimed hardwood surfaces. unifying metallic elements. This modern rustic design with its vertical layout minimizes the footprint and allows the maximum number of mature trees to remain on the lot. The small footprint meant locating the basement under the garage and using a concrete plank structural system. The entry to the home is withdrawn, with few windows facing towards the public roadway, even the front door is situated around to the side. The rear of the home opens up towards the Mississippi with large areas of vision glass and outdoor spaces to enjoy the backyard overlooking the river and trees. traditional rear walk-out. open floor plan. zero clearance entry. clean white finishes. Prominent features of this home include zero clearance steps along with a large covered entry and extra wide doors throughout that easily accommodate access and maneuvering of a wheelchair. The homeowner chose Modern Construction for innovation, quality and value to ensure the perfect house for their needs. Their design required additional structural considerations and challenges which Jesse was happy to take on to make this their custom dream home. modern farmhouse. rooftop garden. pop of color finishes. t-stud build with geothermal efficiency. This home contains the premier components of energy efficiency and custom building. It is built exclusively using t-stud building materials. Temperature regulated with Geothermal heating and cooling system, zoned HVAC, as well as the full home closed cell spray foam package. Top of the line windows featuring low E passive sun with heat lock. Interior bamboo hardwood flooring in the kitchen, farmhouse sink, custom wood kitchen countertop and vanity by local artist, also the master shower has a steam feature with Aroma and Chroma therapy. The rooftop showcases Cumaru Exotic hardwood (real wood but maintenance free) a natural gas fire pit and natural gas tiki torches. The metal railing is custom fabricated by local hobby fabricator and the sand/water feature and plants are all real with the home engineered for the weight. modern farmhouse on wooded acreage. open floor plan. warm cozy dark finishes. mixed metal accents. A modern farmhouse feel with a covered wrap-around porch tucked onto a fully wooded lot. The main level highlights acacia hardwood floors, custom pantry with barn door accent, knotty alder cabinetry with custom built-ins, honed finish granite counter tops, copper farmhouse kitchen sink with single handle pull down faucet and a large sun-room with top of the line low E passive sun with heat lock windows. Finish details include 42 inch steps and 62-10 grab rails which open up the staircases to make an easy exit to the rear facing patio and upper level. It features 9 ft ceilings, a stone framed (each custom to every build) gas fireplace and custom box mantle. traditional ranch built slab on grade. custom colored concrete. stone wall fireplace. clean white finishes. This particular home is built slab on grade. We used non-traditional footings on this home that prevent the ground beneath the house from freezing. It also saves the home-owner money, not constantly fighting to warm the home. Custom colored concrete is also a major feature of this home. The concrete runs throughout the home including bedrooms and bathrooms completely avoiding allergens often found in carpet. The floor to ceiling stone wall in this home showcase the gas fireplace and custom box mantle. traditional rambler. split master 'aging in place' concept. show room 6 car garage. custom trim package. The mastery behind this custom home is an 'aging in place' concept. The design is by two sons who wanted their mothers to remain independent at home into retirement and advancing age. The split master concept includes TWO master bedrooms each with their own master bathroom suite with common living room and kitchen areas. Future accommodations included in the design are extra wide hallways, 36 inch doors, roll-in showers and door handles versus knobs for easy mobility and access. This 2800 square foot home is a slab on grade traditional rambler, with in-floor Geothermal heating and cooling and boasts a heated 6-car garage with show room floor quality finishes. Interior features include alder cabinets with 42 inch uppers and custom designed 7 piece trim package for all windows and doors. traditional cottage. indoor & outdoor entertaining. covered porch. custom built-ins. The focus of this traditional cottage home was entertaining. 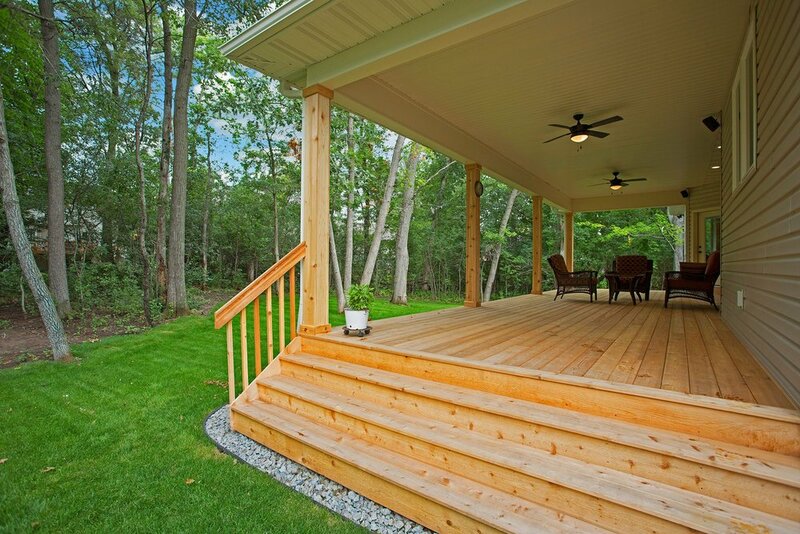 This massive exterior covered porch is easily accessible from the master bedroom or the kitchen. It measures 16 feet by 30 feet and completely covered with full width steps designed to be railing free. It is built with low maintenance cedar, fully wired for lighting, fans, and a built-in sound system. It is designed for future enclosure as well. Featured inside is stained stamped concrete, an entry way drop zone, stone accent gas fireplace and custom built-ins including large bar area in the lower level. grand river front property. vaulted ceilings. two homes in one. bonus rooms. This picture perfect cottage style home sits on the banks of the Mississippi River. The vision came from a pastor and his wife who host missionaries from all over the world. They wanted to provide their guests with the comforts of home during their travels. A home within a home. The primary residence is the entire main level and it features 20 foot high vaulted ceilings with custom ship-lap & beam finishes, a gardening space and workout facility. The second floor is a 3 bed, 2 bath guest house with a bonus room above the garage, private entrance, separate laundry room and roof top deck overlooking the river. Beautiful selections of Carrara marble, granite and white quartz highlight the kitchens and master bath. The home itself is build slab on grade, with a 50% spray foam package, Geothermal heating and cooling system, a 5-stall garage, full concrete driveway and path, extensive stone work and pre-finished LP Smart Siding.